Have you been enjoying the chorus of night-singing insects this summer? I've been listening to the wondrous variety of night sounds... from crickets, to katydids, to trigs. When I get a chance, I try to sneak up on the singing insects and observe them as they produce their songs. The other night, I was out stalking night-singing insects when I heard a 'skritching' sound coming from a dead Rhododendron bush. I believe what I heard was a Clicker Round-wing Katydid singing from the bush. Because there were no leaves to hide this green, katydid-looking insect, it was easy to see. I snapped a photo of this round-winged katydid (Amblycorypha sp) as it sang its 'skritchy' song. Then I took a video of the katydid singing. In the video, you can hear a loud chorus of katydids as well as various other sounds of night-singing insects. 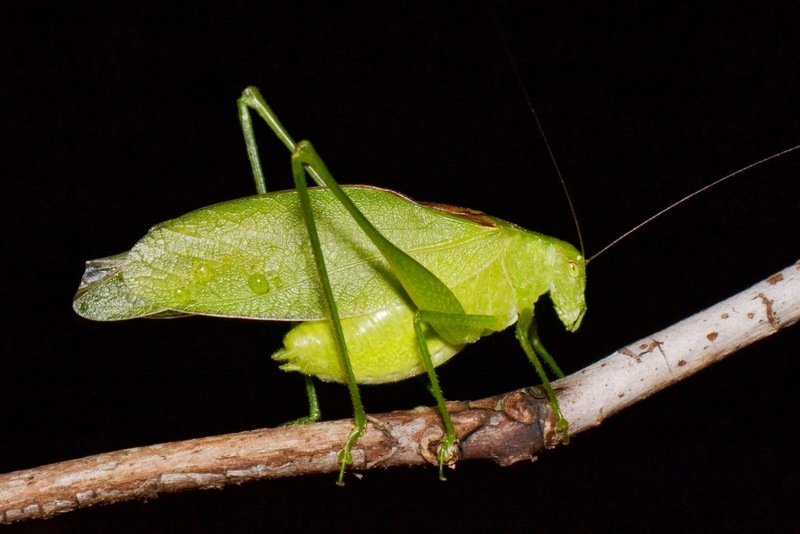 Listen close for the calls of the Clicker Round-winged Katydid in this video. Notice in the video of the katydid singing, how the katydid makes its sounds by rubbing its fore-wings against each other. That stridulary area is a light tan color, while the rest of the katydid is all green. Yes, more posts about night-singing insects are coming soon. In the mean-time, check out my post about a cricket that sings through a hole in a leaf to amplify its song.